Watch out for wasps now! 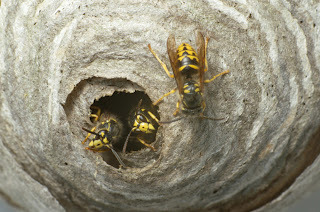 August and September is prime time to see wasp nests in and around homes. What you do about any nest you find will depend on where you find it. 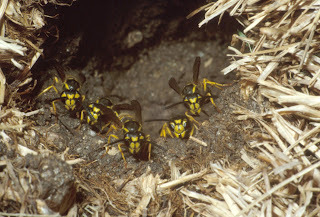 There are three general scenarios where wasp nests can be located: exposed nests, hidden nests, or nests in the ground. Exposed nests, i.e. those attached to a surface and are clearly visible, such as the eaves of a home or the branch of a tree are the easiest to control. If they are found in out of the way places, where there is little or no risk of stings, the best thing to do is ignore it. Eventually freezing temperatures will kill all of the wasps in the nest. If the nest is close to human activity, and there is a risk of stings, then it should be controlled. This is a straightforward task that residents can do themselves. Use an aerosol can of insecticide labelled for wasps and hornets and spray into the nest entrance. Do this during late evening when wasps are not very active. One application is usually all that is necessary to eliminate wasps; if there is still activity, you can always repeat the treatment in a day or two. Nests can be concealed so that all that is visible is a space where the wasps fly back and forth but the actual nest itself is not seen. It is common for wasps to nest in wall voids, attics, spaces under stairs and similar sites. bricks but the nest is not visible. Jeff Hahn, U of M Ext. The instinct for some people would be to take an aerosol can of insecticide and spray into the opening where you see the wasp activity. Unfortunately, this is not effective as the nest does not line up where this opening is located, so the insecticide does not actually get into the nest and affect the entire colony. People might also be tempted to plug up the opening to try to prevent the wasps from getting out. Not a good idea. The wasps will just go another direction, which usually means into a home. It is common for people to be suddenly besieged with wasps after sealing or spraying an opening. The best control is to apply a dust into the opening. This product must be labeled for use in and around homes. Unfortunately, there are not many products available to residents. One example is Bonide’s Spider & Ground Bee Killer. 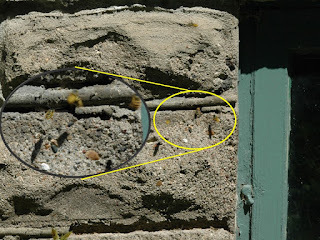 This a challenging wasp situation for residents to treat and it is usually better to hire a professional pest control company to dispatch a wasp nest like this. Wasps also commonly nest in the ground, especially in old rodent burrows. It is similar to hidden nests; you can see the opening that leads to the nest but you can’t see the actual nest itself. These nests are not easily found; it is not unusual for people to notice these ground wasp nests for the first time during late summer. If a ground nest is in a place away from people, ignore it and they will die by the end of fall. If there is a risk of stings, use a dust or granular insecticide, something labeled for turf, to treat the nest. It is always an option for residents to hire a professional, a pest control technician for a nest on or in structures or landscape applicator for nests in turf, to treat wasp nests anytime they would rather not deal with it themselves. For more information, see Wasps.